Suzy Parish is an author at Pelican Book Group. Suzy wrote as a Community Columnist for the Huntsville Times. She is currently a member of American Christian Fiction Writers (ACFW). 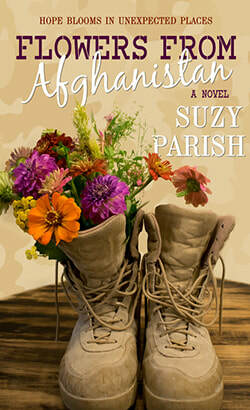 Her novel Flowers from Afghanistan was a semi-finalist in the Genesis contest for 2013. Suzy discovered her love of books as a child in Richmond, Virginia when she took refuge from the summer heat in the local Bookmobile. She believes in the power of literacy to improve the lives of individuals and stewards a Little Free Library in a local park. Suzy currently resides in Huntsville, Alabama with her husband, Chet. Her tennis ball-addicted dog Charlie keeps her life filled with daily mayhem.